We know those sunny days and May flowers are on the way, but we still have to get through a few more April showers (or, you know, snowstorms — hi, New England!) first. And while those showers are a-showering, the kids in your life are likely moping around the house complaining of boredom, zoning out in front of the TV or, worse, “accidentally” playing with non-toys and breaking them. The best way to prevent kids from going nuts in the house is to plan fun and educational activities you’ll both enjoy. And no, kid-friendly crafts and science projects don’t have to be complicated or expensive. The simple rainbow “experiment” below uses ingredients you most likely have in your kitchen already. And anyway, if it’s raining outside, we might as well create rainbows inside, right? As far as science projects go, this one is a fun and festive winner. Sure, science-wise, kids love to make explosions and watch things form bubbles. While this rainbow doesn’t explode all over (that just doesn’t seem necessary, right? ), it will definitely erupt and bubble over. Ready to have some fun? Keep scrolling for directions. Place a drop of food coloring at the bottom of each plastic container. Fill up each container 1/2 way with vinegar. 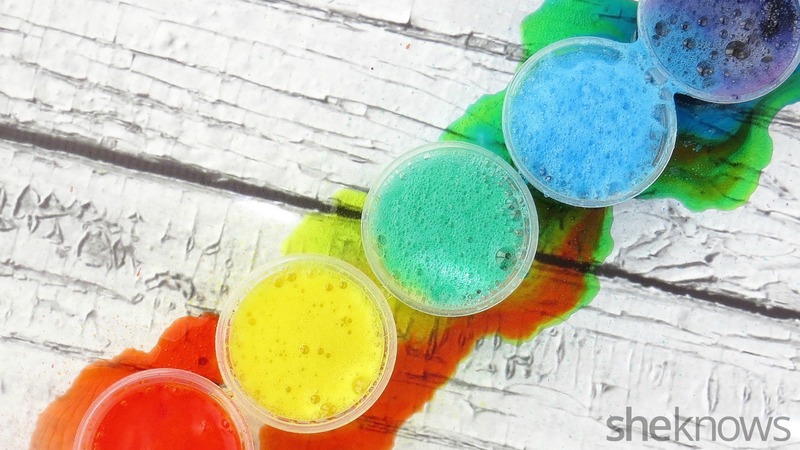 When the kids are ready, drop 1 to 2 teaspoons of baking soda into each plastic cup. The mixture will start to fizz, then it will bubble, then it will rise, and before you know it, the colors will explode over the containers and melt into each other on the hard surface. The reaction happens quickly, so be ready. If there is leftover liquid in the containers, add a little more baking soda or vinegar, and watch it happen again. And don’t forget to explain to kids how it works: Carbon dioxide is a gas that’s created when vinegar (an acid) is mixed with baking soda (a base). If that’s too complicated for younger kids, you can simply discuss the mixing of the colors. Ask questions about what happens when certain colors mix. You can even have them make predictions about what they think will happen before the experiment starts. At the end, have them observe the mixed colors and tell you about what they find. For older kids, have them write down their predictions first; they’re likely used to doing this in school science class. They can even draw a picture of their prediction. Next, explain the buzzwords: acid, base and gas. Once the rainbow is done exploding, have them write down what happened. Then have them discuss, draw or write out their conclusions. You’ve played, you’ve learned, you’ve stimulated minds, and best of all, you’ve had fun.